"Arizona Stonewall Democrats are rebuilding in Tucson"
Hoping to try and change the face of Grand Canyon State politics, a group in Tucson is reviving the Arizona Stonewall Democrats. According to its Facebook page, there is "a huge untapped pool of energy within the LGBT community and its allies," and the group plans to channel that energy to push for equal rights for everyone. Capitalizing on the momentum over SB 1062, the religious freedom bill that looked to codify anti-gay bigotry into law, Robert Rowley and Richard Adams registered the LGBT club in April with the Arizona Secretary of State's Office. Being a political action committee means the group can spend money to support or oppose any state-level candidate. Rowley told the Observer the group wants to remind voters in November how various candidates voted on SB 1062 and it's preparing to send a questionnaire to all candidates. The group will then grade the candidates responses and pass along its findings. For example: The Arizona Daily Star reported that the group has not-so-subtly hinted it could spend on ads against gubernatorial candidate Doug Ducey. That's because Cathi Herrod, who pushed SB 1062, is one of Ducey's advisers. Ducey said he would have vetoed SB 1062, but also said "the religious liberty issues that SB 1062 attempts to address are legitimate ones. Founded in 1998 by U.S. Rep. Barney Frank of Massachusetts, the National Stonewall Democrats is currently on hiatus. 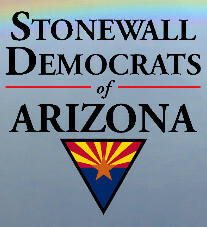 Previously there have been several iterations of the Arizona Stonewall Democrats.